AC Cool is an award-winning Carrier Factory Authorized Dealer that provides Orange County homes and businesses with exceptional heating and air conditioning services. 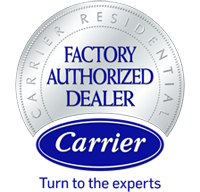 Being a Carrier Factory Authorized Dealer means that we are highly qualified to install, repair, and maintain all Carrier products, including air conditioners, furnaces, heat pumps, mini-split ductless systems, air purifiers, and thermostats. Carrier is the name associated with the invention of modern air conditioning. Since 1902, Carrier has become an industry leader by consistently improving upon their indoor heating and air conditioning solutions. Their diverse line of heating and cooling products are known for featuring innovative technology, being environmentally responsible, and offering high performance with impressive energy efficiency. Moreover, Carrier has further set itself apart from other brands by defining itself on its unparalleled commitment to customer care and satisfaction. In order to be a Carrier Factory Authorized Dealer, AC Cool had to meet a number of strict requirements set by Carrier. This includes having proper licenses and insurance, employing NATE certified installers and service technicians, participating in ongoing factory training, and demonstrating excellence in the quality of service we provide to customers. We have provided an overview of some of Carrier's most popular heating and air conditioning products below. If you would like to know more, call us today to schedule a free, no-obligation in-home consultation with our Comfort Advisor. Our Comfort Advisor will assess the size and layout of your home, check your existing HVAC equipment, and inspect air loss from the associated ductwork in order to provide you with a few heating and/or cooling options that best meet your needs. Your Advisor will also let you know of any available rebates, promotions, and special financing offers. Katie answered our call with a smile (you could tell) and was able to help us out during this heat wave. She said they were running a special emergency on call service and they could get us in! Paul arrived the next day was quick and got the job done! Paul was very informative and helpful. We would definitely use AC Cool again.. (hopefully we do t need them anytime soon , though). But if we did they would be the first company we call! Thank you so much to AC cool! Our home is now "cool"